The 2017 summary report by the FDA on antibiotic use Antimicrobials Sold or Distributed for Use in Food-Producing Animals clearly demonstrated the effect of restrictions on the use of antibiotics in livestock for other than therapeutic purposes. An additional component was placing the onus on the Veterinary profession to prescribe and authorize antibiotics for livestock. The Report documents a reduction of 33 percent in sale and hence consumption of medically-important antibiotics for animal use between 2016 and 2017. A significant observation is that antibiotics used to produce chickens declined by 47 percent to represent 4.8 percent of livestock use in 2017 compared to 2016. Administration of antibiotics to turkeys declined 11 percent from 2016 to represent 12 percent of all livestock use. Rapid diagnosis is critical to control Infectious Laryngotracheitis (ILT), an economically important disease in poultry. The BioChek Fowl Laryngotracheitis DNA reagent pack will detect the presence of ILT DNA in extracts from avian tissue and swab samples. The BioChek ILT PCR reagent pack contains an easy-to-prepare Reaction Mix and includes all necessary controls. All BioChek reagent packs use the same protocol, allowing different assays to be run simultaneously. The ILT PCR reagent pack, as with all BioChek PCR products is validated for use with most leading thermocyclers used in poultry laboratories. Use of PCR standards allows quantification of ILT virus. Prior to release, all BioChek PCR reagent packs, including the ILT PCR reagent pack, undergo strict validation procedures. BioChek PCR reagent packs are continuously upgraded to be clinically current through continuous validation against emerging and evolving field strains. Convenient and unique BioChek poultry software combines sample set-up, data collection and analysis with optimimal reporting using a single program and database for both PCR reagent packs and ELISA assays. Using the software while performing PCR testing saves significant operator time and effort while reducing the risk of errors in data entry. Reports generated by the software are clear and structured to facilitate analysis and comparison of data. BioChek monitoring software interfaces with most commonly used thermocyclers. 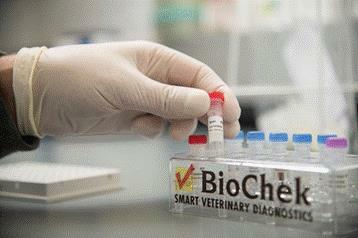 BioChek offers PCR reagent packs for NDV, ORT, IBV and Campylobacter. A complimentary E-booklet is available to learn more about PCR technology by accessing <www.biochek.com> For additional information contact Tim Goode at <timgoode@biochek.com>. Bill Snow, an acknowledged expert on management of aviary systems for rearing pullets and for egg production has authored a guide incorporating his experience with Big Dutchman installations. Topics considered include lighting, feeding, ventilation, egg collection and maintaining litter quality among other considerations. EGG-CITE has reproduced the article which contains valuable principles and recommendations for the benefit of subscribers. In a recent presentation at the Institute for Food Technologists 2016 Annual Meeting, the Clean Label Revolution was reviewed based on a study conducted by C+R Research. The project funded by the IFT included a survey of 1,000 U.S. consumers of whom 7 in 10 claimed to read labels on a regular basis. The Vigilante comprising 20 percent of the sample payed close attention to product labels. Most of this category are represented by boomers. The Keep-it- Simple category comprising 47 percent vaguely want to eat healthier but do not want to invest time in either study or reading labels. This group was represented by Generation Y or Millennials. The Unconcerned representing 17 percent of the sample are more interested in value and convenience then health. This group comprise Generation Y consumers who are interested in value especially when raising children. Boomers who have more health concerns based on their age and in many cases have more time to shop indicated that they are concentrating on specific foods based on labels. Of interest from the study is the surprising finding that over a third of those surveyed did not consider GM status as affecting their purchased decisions. This finding was common across all four generations. The most important label indications influencing the purchase decision included sugar, sodium, fat, preservatives, artificial sweeteners and trans fat. Attributes or nutrients of less concern included probiotics, prebiotics and organic status. In a press release dated July 11th, USPOULTRY presented the results of a series of experiments conducted by Dr. Haroldo Toro of Auburn University (Project number BRU 004). The study was conducted using funds approved for emergency research related to the outbreak of highly pathogenic Avian Influenza in the spring of last year. The study to inactivate Avian Influenza virus in feed is the first of a series of projects completed using fast-track funding. The series of four trials was conducted to evaluate the effectiveness of Termin-8® on inactivation of an H5 strain of LPAI virus added to feed under controlled experimental conditions. The secondary objective was to demonstrate the residual effect of Termin-8® on inactivation of AIV in feed. The model used by Dr. Toro comprised contamination of a layer feed with a low- pathogenic AIV, strain H5N9 isolated from turkeys in Wisconsin in 1968. The presence of virus in feed was identified by an extraction process followed by treatment with antibiotic to destroy bacteria and then centrifugation and filtration. The presence of influenza virus was identified by inoculating processed supernatant into embryonated specific pathogen-free eggs with subsequent demonstration of viral RNA in allantoic fluid using RT-PCR. In the first experiment to determine effectiveness of Termin-8® it was demonstrated that the concentration of virus was reduced after 4 hours following inoculation of feed previously treated with Termin-8® at the rate of 2 pounds per ton. In a second trial to evaluate survival of AIV in either feed or corn, it was demonstrated that relatively high levels of virus were maintained following inoculation for 24 hours with a decline to undetectable levels after 48 hours. Termin-8® effectively reduced the concentration of AIV in feed within one hour by a level of 6 LOG10 compared to untreated feed. After six hours there was a significant difference in concentration of AIV between the treatment and control with the feed devoid of Termin-8® showing levels ranging from 4 to 8 LOG10 per gram of feed. The residual effect of Termin-8® was evaluated by adding the compound to feed seven days before inoculation with AIV. Control and treated feed were assayed for the presence of AIV after six hours. Concentration of virus in the untreated control feed ranged from 2 to 8 LOG10 program compared to undetectable level in the feed treated with Termin-8®. The series of trials conducted by Dr. Toro demonstrated the effectiveness of Termin-8® in suppressing AIV in feed. In addition the compound was effective for at least seven days after being added to feed. Although feed is not regarded as a primary route of introducing AIV onto farms, a coordinated program of protection should include suppression of possible transmission associated with delivering contaminated feed to susceptible flocks. During a recent vacation visit Spain the opportunity arose to review eggs in supermarkets and urban produce markets which cater to a high proportion of city residents. Spain is the 4th largest producer of eggs in the EU, currently with approximately 45 million hens based on egg production as documented in the GAIN Report (SP1538) released on October 28, 2015. The hen population has fluctuated over the past six years. In 2010, Germany banned conventional cages approximately two years before the EU deadline. This necessitated importation of eggs from Holland and Spain with a resulting rise in the number of hens to 52 million. Following installation of new housing in Germany, demand for imports fell negatively impacting producers in Spain. At the present time there are approximately 1,150 egg farms with an average of 40,000 hens in each facility with 90 percent held in enriched colony modules. Spain did receive a benefit from the 2015 U.S. outbreak of avian influenza which impacted the breaking industry disproportionately to shell eggs. Between late June and early October, USDA Agricultural Marketing Services issued import licenses for approximately 12 million dozen eggs for breaking, representing approximately one-third of U.S. imports of breaking stock. Given the restoration of flock numbers in 2016 and the consequential collapse in the price of breaking stock, exports to the U.S. have ceased. In 2014, the USDA-FAS estimated a net export of 147,000 metric ton of eggs from Spain representing 204 million dozen. The downturn in the EU economy has apparently reduced consumption from 239 eggs per capita to 206 in 2013 constituting a 14 percent decline. The net result of decreased exports to the U.S. and European nations together with competition from the Ukraine has produced a crisis with extreme competition among producers and cooperatives for the available market. The combined effect of reduced exports to Germany together with a shortage of capital to replace conventional cages resulted in a reduction in flock size from 51 million in 2010 to 39 million in 2013. Some relief has been gained through developing export markets outside the EU including North Africa. There has been an increase in the production and shipment of egg products to alleviate the over- production of shell eggs. The following images illustrate packaging at the supermarket level with prices converted to U.S. $ per dozen. In compliance with EU regulations all eggs packed commercially in Spain are stamped with an inkjet code. The following article was presented during the Pre-Conference Nutrition Session before the 2016 Midwest Poultry Federation Convention in Saint-Paul on March15th. The information provided is helpful to an understanding of intestinal function and the benefits of supplementing with products that release butyric acid in the cecum and terminal ileum. Vanessa Iseri, PhD. Kemin Industries, Inc.
Due to customer demands, producers have been asked to change the way they grow production animals, specifically through the removal of antibiotics. With this need comes necessary changes to animal production as a whole, starting with management, feed, and vaccination programs. To make those changes, an endless number of alternatives are being considered in order to meet the same feed efficiency, growth rate, and egg production standards that are accomplished with antibiotics. With that, comes a need to better understand how gut health is affected by these alternatives. Gut health in both human medicine and animal health has been defined in various ways. It was initially described that good gut health was the absence of illness. However, through our development of molecular tools and a better understanding of intestinal biology, it is clear that there are many factors that contribute to gut health. The intestinal barrier, microbiota and intestinal immunity can be considered the three main factors that attribute to gut health, but more importantly the interactions of these systems. Soon after hatch, the chick’s gastrointestinal (GI) tract comes into contact with exogenous microorganisms and quickly develops into a complex microbial ecosystem. Each section along the intestinal tract contains distinct microbial communities, in which multiple species of Lactobacillus, Enterococcus and Clostridium mostly populate the ileum as opposed to species of Bacteroides, Bifidobacterium, and Clostridium in the cecum. The relationship between the host and microbiota can be described has a symbiotic one, in which both benefit. The host provides a protected, nutrient-rich environment which allows the microbiota to establish a diverse, yet remarkably resilient ecosystem. In return, the microbiota provides resistance to the colonization of pathogenic microbes, aid in the development and maintenance of intestinal and systemic immunity, support intestinal structure development, and produce nutritional factors. Any dramatic shifts in the microbial population due to dietary changes, or pathogens can be detrimental to the host. The epithelial barrier has the large task of absorbing nutrients, yet at the same time protecting the host from invading pathogens, toxins, and antigens, as well as the abundant microbial populations in the intestine. Besides nutrient absorption and host protection, enterocytes are capable of acting as frontline sensors to microbial encounters in order to guide immune response. Specialized epithelial subsets enteroendocrine cells, goblet cells, Paneth cells, and M cells also contribute to maintaining a physical (i.e. mucus) and chemical barrier (i.e. β-defensins) between the outside environment and the host. An important component to maintaining the intestinal barrier are tight junctions, which are made up of multifunctional protein complexes. Tight junctions seal the paracellular space between epithelial cells, thus preventing the translocation of microorganisms and other antigens across the epithelium. Tight junctions are highly dynamic structures, and their permeability is regulated by various factors such as diet, microbes, inflammation. With the continual exposure of microbiota and both dietary and environmental antigens, the intestinal immune system must balance between tolerance and responding to challenges. Thus, the intestinal immune system plays a huge role in overseeing the interactions between the host and the microbiota, through a network of immune cells, cytokines, chemokines and other immunological mediators. Hooper and Macpherson describe the intestinal immune system as having three levels of protection each with distinct mechanisms. The first layer of protection is the secretion of chemical barriers, such as secretory IgA, that minimize the ability of bacteria to adhere to the epithelial lining. The second layer is the detection and elimination of bacteria that has translocated by phagocytic cells in addition to their role in intestinal wound healing. The third layer is the network of cells and immune proteins that allow the intestinal immune system to quickly respond to infection using minimal inflammation, and containing the infection at the intestinal level. As mentioned above, the microbiota, epithelial barrier, and intestinal immune system are key factors that affect gut health, and the interactions of all three of these systems are necessary for both the development and maintenance of gut health. Key examples that illustrate this point are the development and maturation of the intestinal immune system through its interactions with the microbiota; epithelial homeostasis is based on its interactions with the microbiota; and the interactions of the intestinal immune system and epithelial barrier allow for the containment and stability of the microbial populations. Dr. John McCarty, Senior Veterinarian, Merial, Inc.
Dr. John McCarty has prepared a practical article dealing with control of coccidiosis in broiler growing with reference to winter conditions. Successful application of vaccines requires appropriate administration and structured monitoring as described. Coccidiosis can have an enormous impact on broiler performance which is most often reflected in reduced weight gain and decreased feed efficiency. It is considered to be the most costly pathogen challenge in modern broiler production in the U.S. While coccidiosis is a year-round problem, cold weather conditions can result in changes in the ecology in a broiler house that lead to increased cocci challenge. When the weather cools and the houses tighten up, disease challenge tends to increase in the chicken house. As ventilation is decreased to help conserve heat, more moisture remains in the house. The increased moisture, especially in the litter, favors increased bacterial, viral, and cocci load. Coccidia need moisture and heat for the oocysts to sporulate. Once these are sporulated, oocysts become infective to the chicken. The increase in moisture can lead to greater sporulation of the oocyst population. And, as more of the oocysts sporulate, birds are faced with a heavier cocci challenge. The use of coccidiosis vaccines can help influence the nature of the load. Continued use of vaccines helps dilute the wild cocci population with a vaccine strain. In particular, vaccines with precocious strains place minimal stress on the bird while at the same time providing adequate stimulation for immunity development, and the bird can be protected with less stress. The nature of the precocious strain vaccines allows for the increase of sporulation to be less detrimental, since the number of oocysts shed are less when compared to non-precocious strains of cocci. Even though there are fewer numbers of oocyst with the precocious strains of vaccine, the number present is still more than adequate to stimulate proper and complete immunity. as that caused by coccidiosis, provides opportunity for clostridial organisms to infect the gut and to cause disease such as necrotic enteritis. By reducing the level of coccidiosis, less disruption in the gut provides less opportunity for clostridial infection. This would also help the bird regarding nonspecific enteritis, both clinical and subclinical. There are many ways to prepare for the cooler months, but assuring proper cocci control prior to the onset of cold weather will keep a low cocci load in the house. Then, the use of a precocious vaccine strain during these months of the year allows for minimal stress on the bird’s digestive system while still providing optimum immunity against cocci. It will also be important to continually monitor the cocci challenge. Doing routine postings of broilers to assure there is proper cycling helps confirm that the vaccine is doing its job of developing proper immunity. Ken Rudd, Biobusiness Consultants, Galena, IL. Vaccination was one of the more contentious issues arising from the Spring 2015 epornitic of HPAI in upper Midwest states. The infection was and still is regarded as an exotic disease necessitating eradication. Despite widespread and intensive depletion of affected farms following rapid diagnosis, cases were diagnosed on large units on a daily basis in late April, May and early June. This resulted in turkey and egg producers at risk to request the USDA-APHIS to allow the use of inactivated vaccine as a component of the control program. As it turned out a decision was made not to introduce vaccination. This was due to strong opposition from the broiler producers who were completely unaffected and were justifiably concerned over losing their export markets for leg quarters estimated at close to 3 million metric tons and valued at $4.5 billion in 2015. Fortunately the efforts to eradicate infection through quarantines and depletion of affected farms by the USDA-APHIS together with cessation of shedding of virus by waterfowl carriers in April and enhanced biosecurity resulted in an end to incident cases by mid-June. The USDA APHIS has confirmed that in the event of a future serious outbreak, possibly involving the broiler and turkey-producing states under the Atlantic flyway, vaccine would be employed as a component of a control program. To this effect, contracts have been awarded to two manufacturers to create a stockpile of H5 vaccine. The role of vaccination in the control of avian influenza has been reviewed on poultry-related websites and periodicals and was the subject of a recent webinar Vaccination as Part of an Avian Flu Eradication Plan with three speakers considering vaccination as a control measure from their respective experience. Dr. Catharina Berge Rebuts Comments on Raw Milk and Small-scale Production. Based on the epidemiologic information emanating from research on the recent outbreak of HPAI in the upper Midwest, and following site visits to clients, the attached draft biosecurity scoresheets are provided for the guidance of Subscribers to EGG-CITE. It is necessary to evaluate biosecurity according to a hierarchy and accordingly separate pages are provided for conceptual biosecurity, structural biosecurity and operational biosecurity. A fourth page deals with complexes receiving feed from a mill not located on the complex. The concept of the biosecurity evaluation relates to assessing the risk of introduction of disease into an operation and the subsequent dissemination of disease among complexes. A maximum score would be assigned if there was no appropriate conceptual approach, structural installations or operational procedure. The auditor would assign a facility score less than the maximum risk score based on experience and comparisons among U.S. egg-production operations. For example any specific complex in Darke County, OH. or Sioux County, IA. would probably be assigned a score of 200 for “population density” since these areas have a high concentration of hens and turkeys operated by different companies located in close proximity. In contrast an isolated complex in Arizona or Utah would be assigned a score of 0 to 10 on population density since it is the only facility with commercial poultry within 250 miles. It is therefore obvious that facilities which operate with a high level of conceptual, structural and operational biosecurity will have low risk scores compared to what may be regarded as the maximum value of risk given the provisional scoring. The Nutrition Physiology Co. LLC., (NPC) is actively promoting PoultriMax® as an integrated solution to the control of foodborne pathogens. Their products comprise both a hatchery-administered spray or gel to colonize the intestinal tract of chicks and poults with a viable suspension of a specific strain of Lactobacillus animalis (commercially-L.acidophilus) and a complementary probiotic feed additive. Colonization of the beneficial organism established in the hatchery is then reinforced and extended by administration in feed during the growing period. Effective administration of PoultriMax® which incorporates a live Lactobacillus animalis in feed for growing flocks is achieved by using a patented post-pelleting application process. The introduction of “beneficial” microorganisms into the pioneer flora should enhance protection against pathogenic food-borne bacteria and enhance production. The Food and Agricultural Organization defines probiotics as live micro-organisms, which when consumed in adequate amounts, can elicit beneficial health effects for the host. The probiotic strain must remain stable during preparation, reconstitution and administration and retain inherent beneficial metabolic characteristics after ingestion. The strain must reach the intended site in the intestinal tract to achieve beneficial effects, despite exposure to an acid environment in the stomach and potential degradation by digestive enzymes. Probiotics must exert a beneficial effect without any deleterious side effects. A hearing on Highly Pathogenic Avian Influenza (HPAI) before the Senate Agriculture, Nutrition and Forestry Committee under the chairmanship of Pat Roberts (R-KS) took place on The July 7th. The two-hour session was characterized by a reasoned and accurate recounting of facts and incorporated a candid assessment of the future by Dr. John Clifford, Chief Veterinary Officer of the USDA and Dr. David Swayne, Director of the Southeast Poultry Research Laboratory (SEPRL)-ARS-USDA. Testimony was also provided by Jim Dean, Chairman of United Egg Producers, Brad Moline representing the National Turkey Federation, Ken Klippen of Egg Farmers of America and Dr. Thomas Elam an agricultural economist who reviewed the financial impact of the 2015 HPAI outbreak. The Spring 2015 H5N2 outbreak in the upper Midwest was the most extensive and costly animal health emergency in the history of the U.S. It is now evident that the disease has been contained with no new cases reported for 20 days. From the outset, clear and unequivocal messages from the USDA, state officials and the CDC were instrumental in reassuring the public that the infection was not transmissible to humans and the virus was not carried on eggs or turkey meat entering the food chain. In his testimony, Dr. Clifford emphasized that the outbreak did not impose any risk to either food safety or public health. A program organized by Zoetis and the National Cattleman’s Beef Association facilitated discussion and practical examples relating to the Veterinary Feed Directive (VFD). A number of the questions and the responses by specialists including Dr. Mike Apley of Kansas State University are applicable to the broiler industry. Extra label use is banned under the new guidelines and it is therefore not a viable alternative to compliance with statutory label descriptions. Each Veterinary Feed Directive issued by an independent Veterinary Practitioner or Veterinarian employed by an integrator must be specific for the state in which the Veterinarian is licensed. This will have profound implications for large companies that operate in more than one state. The Ionophore anticioccidials are not regarded as “medically important” (to humans) and therefore do not require a VFD prescription. If however an antibacterial compound such as tylosin is fed concurrently with an ionophore, a prescription is required in accordance with the guidelines. A Veterinary Feed Directive requirement allows a prescription to apply to more than a single flock raised on a complex and would not require a separate prescription for each contract farm. The Food and Drug Administration requires that Veterinarians specify the duration of medication and the level of inclusion in feed. At the Veterinarian’s discretion, a generic can be substituted for a branded product. There are exceptions to this practice since if a combination product including a generic is not approved it would represent extra-label use and therefore is disallowed. Veterinarians owning and operating their own facilities and by extension, applicable to Veterinarians employed by corporate entities, are able to prescribe antibiotics for their own operations or those under their control. Is the prescription in accordance with prudent use principles? Will the prescription comply with the statutory withdrawal period before processing? Could antibiotic resistance be facilitated through proposed medication? The following compounds will convert from over-the-counter sales to prescription in 2017. On Friday 12th June, the USDA presented their weekly progress report on control and eventual eradication of HPAI. Topics reviewed included the current situation, investigations of the epidemiology of the current outbreak and contingency planning for future outbreaks. No new outbreaks were detected during the week ending June 12th in either commercial turkeys or laying hens. Depopulation is proceeding well but flocks are still being processed from the most recent outbreaks in Nebraska. Disposal of caged flocks in Iowa with the largest number of birds euthanized is moving ahead with two landfills now accepting bagged hens. Two small incinerators are in operation with a third unit due to come on line. At this time among layer chickens and pullets, 7.5 percent of all flocks depopulated are pending disposal with 4.4 percent in Nebraska and 2 percent in Iowa involving four and three premises respectively. Losses to date represent 10 percent of average layer inventory and five percent of average pullet inventory. Backyard flocks and hatcheries distributing eggs and chicks still represent a potential problem. One operation in Iowa recently shipped fertile eggs and chicks to 35 states in 100 consignments. EGG-CITE had the opportunity to discuss the formation of Hendrix-ISA, LLC with the GM, Peter Mumm at a recent industry meeting. The items discussed are of interest to the readership of EGG-CITE and the U.S. egg production industry. Peter Mumm: I graduated in 1994 from the University of Wisconsin majoring in poultry science. During my high school and university education I worked during summers on farms and recognized that I wanted to make chickens my career. Over the past 20 years I have worked for a number of companies including Creekwood Farms, Dean’s Eggs, Primera Foods, Daylay and have spent the last seven years as the Director of Operations of Midwest Foods Association . EGGCITE: You are now the General Manager of a new company Hendrix-ISA, LLC. What led to the formation of this enterprise? Peter Mumm: The Company was founded in January 2015 out of the realization that as a primary breeder, Hendrix Genetics required a substantial and stable presence in the U.S. to ensure consistency of production and quality. Expansion also required considerable capital investment. Accordingly after negotiations, it was agreed that Hendrix would acquire the production facilities and hatcheries of the Midwest Foods Association and follow the model used by the other primary breeder by integrating forward into parent stock. I would add that Hendrix Genetics’ turkey division, Hybrid Turkeys has followed a similar program, with their contract production agreement with Ag Forte. Wildlife biologist affiliated the USDA will commence trapping rodent, small mammals and free- living birds on farms in Iowa to determine whether they are possible carries of avian influenza. The project will be coupled with an epidemiologic investigation of the current epornitic of HPAI. EGG-CITE has previously advocated a comprehensive epidemiologic survey to determine the risk factors associated with outbreaks of highly pathogenic avian influenza strain H5N2 on turkey farms and on large egg-production complexes. Trapping rodents on a farm which has been infected with HPAI will not be very helpful since the quantum of virus shed from over 2 million hens will ensure saturation of the environment. The findings as with previous studies on pasteurellosis will not differentiate between whether the rodents acquired the infectious agent from their environment or whether they serve as shedders capable of transferring virus among farms. These objectives would be better accomplished under controlled laboratory conditions. The important questions are whether rodents or endemic passeriforms (sparrows, pigeons and crows) can be infected and if so, the duration of shedding and if not how long they may serve as potential mechanical vectors. Turkey and egg producers representing different segments of the industry need to know the risk factors contributing to outbreaks in order to plan and implement appropriate and effective protective measures. There are currently a number of theories being advanced by poultry health professionals, wildlife biologists, owners of farms and regulatory officials. Infection of a specific type of farm is obviously subject to a range of factors possibly synergistic in action. By determining the contribution of each possible factor will requires detailed field investigation with on-site observation. Using a mailed-out survey is guaranteed to generate a result. The validity of conclusions, if apparent, will be weaker than using trained observers using a structured questionnaire and documenting findings relating to affected and unaffected farms using a case-control approach. The results of a rigorous epidemiologic investigation should be provided to the industry as soon as possible to guide implementation of effective preventive measures which will require capital expenditure and changes in operational procedures. Egg-producing flocks are sensitive to changes in temperature, excessive atmospheric humidity, ammonia and dust. This is especially the situation during the weeks leading to peak when egg production and case weight is rising and body mass is increasing. There is a direct correlation between air quality and performance. Producers who can effectively control environmental parameters manage flocks with improved health and livability, enhanced egg mass and feed conversion efficiency. VAL-CO® have developed the Hemisphere Fan to overcome problems encountered in cold weather conditions. Cargill recently launched the Cargill Nutrition System (CNS) a proprietary nutrient formulating platform. The CNS utilizes a combination of real-time nutrient analysis, nutrient application research and ingredient sourcing to provide poultry producers with clear data and applicable solutions to help ensure that flocks perform more profitably, efficiently and with enhanced sustainably. Time to Reconsider Control of Resident Canada Geese Near Poultry Farms? The realization over the past two years that free-living migratory waterfowl are significant reservoirs and disseminators of highly pathogenic avian influenza (HPAI) has altered the approach to prevention of the infection in commercial flocks in North America and the EU. A potential problem may occur following cohabitation of infected migrant ducks with free-living non-migratory resident Canada geese (Branta canadensis). In 2005, Innolytics LLC, San Clemente, CA was granted EPA registration for OvoControl® G as a means of “contraception”- control of goose populations on golf courses, airports and on lakes and ponds in subdivisions. At the time these “resident” geese were regarded simply as a nuisance and a mild health hazard. Now we can consider them as a chain in the perpetuation of HPAI if they have direct or indirect contact with poultry, representing a far more serious situation. OvoControl G is a feed containing 0.5 percent nicarbazin in kibble form to be consumed by adult breeding geese with an intended intake of 50 grams per day. Nicarbazin was originally registered in 1955 as a feed additive to prevent coccidiosis in chickens. The compound when ingested by mature breeding birds interferes with the development of the vitelline membrane and eggs from treated geese do not hatch. The use of OvoControl G was evaluated by Innolytics in cooperation with the National Wildlife Research Center of the U.S. Department of Agriculture. The EPA registered OvoControl G (EPA Reg. No. 80224-5) but imposed a number of restrictions limiting the use of the product. These onerous requirements effectively resulted in commercial failure of OvoControl G for a number of reasons. The product requires at least three years to reduce resident populations of geese in an area by approximately 50 percent. This is due to the fact that geese breed annually over an eight-week period and have a lifespan of up to twenty years in the absence of predators. This means that the product does not result in rapid removal of a population such as would be desired on a golf course or airport. EGG-CITE has previously commented on Parts I through III of Layers 2013 prepared by the USDA National Animal Health Monitoring System. Part IV deals with organic egg production, a small but rapidly growing proportion of the U.S. industry. The sample comprised 86 farms although it is not stated how many of the owners of eligible organic-egg units who were approached cooperated in the survey. The other factor detracting from an appreciation of the data is that no detail is provided on the actual number of hens held by the respondents and conversely those that did not participate. Seventy-four percent of the 85 farms housed fewer than 30,000 hens. Six percent, or five farms in the survey held more than 100,000 hens. It is known that the largest USDA Certified Organic egg production units hold between 750 and 1 million hens. Neither of the two largest operations participated. It is accepted in the industry that five percent of companies in the U.S. representing a disproportionate share of the actual number of hens contribute to the supply of organic eggs delivered to the market. Part IV of Layers 2013 attempts to characterize the structure of the organic segment of U.S. egg production within the limitations of participation. Only 7.3 percent of farms but understandably a very small proportion of the total number of hens, were classified as independent with respect to ownership and marketing. About 75 percent of farms operated under a contract arrangement with a packer or marketing company. As opposed to the pattern in the EU, farmer-owned (horizontal) cooperatives involved 11 percent of farms although hen numbers were not stated. Approximately 76 percent of farms had only one house operated for organic productions and six percent had six or more houses. These represented the few in-line units in production other than the largest operations which did not participate in the survey. The capacity of houses ranged from 1,000 to 30,000 hens over 90 percent of the producers. The fact that seven percent of houses held between 30,000 to 100,000 hens reflect the disparity in size between the family-farm/contractor producers and the in-line intensive operations most of which are equipped with aviary installations. The USDA-Foreign Agriculture Service GAIN report for Thailand (TH4076 of September 2nd 2014) forecasts increased production and exports in 2015. The table below depicts the projected production and exports for 2014 and 2015. Currently it is estimated that the cost of production of broilers weighing 2.4kg at 49 days with a feed conversion of 1.8 is between $1.20 to $1.30 per bird. Proportions of cost include chicks, 22%; feed 63%; housing and labor, 14%. The wholesale live broiler price over the first six months of 2014 was 59 U.S. cents per kg. The retail price for raw chicken meat was $1.19 per kilogram. Advances in meteorology and allied disciplines have increased the precision and reliability of short-term weather forecasts. Only recently has it been possible to predict global weather patterns on a seasonal or annual basis. Remote sensing by weather satellite and the deployment of remotely-operated buoys and weather stations reporting oceanic and atmospheric data have created new opportunities to study weather patterns. Advances in computerized processing of large databases and the development of models with increasing complexity and refinement can correlate predictions with actual climatic events. The purpose of predicting major changes in rainfall pattern and temperature are evident. These include selection of appropriate crops, provision for enhanced storage and handling of products. Contingency plans for disease outbreaks and disruption of infrastructure can be completed in advance of severe changes in weather patterns in order to reduce their impact. The severe El Nino event extending through 1997 and 1998 illustrates the global effect of profound weather changes and the various responses that were applied at the international, regional and local levels. Evidence that a new ENSO event is developing suggests the need to understand the causes, development and consequences of an alteration in weather patterns affecting the Americas, Africa, Australia and parts of Europe. Mercy for Animals, known for its ability to infiltrate production facilities and then disseminate graphic visual material alleging cruelty, has posted a video purporting to show inappropriate handling of turkey poults at a hatchery in North Carolina. The video demonstrates operation of an infra-red robotic processing machine responsible for beak and toe trimming and vaccination. It is known that occasionally “hang up” of a poult can occur and the video as posted may reflect such an occurrence or may in fact have been staged. The company also macerates weak and culled poults following industry practice as endorsed by the AVMA. This is contrary to the practice in the broiler industry, where culled and wet “floor chicks” are subjected to euthanasia using carbon dioxide prior to maceration. This procedure was apparently not in operation in the poult hatchery and should be adopted. On September 13, 2013, Miles McEvoy, Deputy Administrator of the National Organic Program issued a memorandum to the National Organic Standards Board (NOSB) informing the group of a change in policy relating to authorization of additives to organic diets. The NOSB is responsible for establishing organic standards and maintaining the National List of Approved Organic Additives and to specify exempted compounds and to revise procedures for organic production. The following guideline for disposal of dead poultry was issued by the North Carolina Department of Agriculture and Consumer Services. The document is reproduced for the benefit of subscribers. It is emphasized that the comprehensive guideline relates to North Carolina only. Producers must comply with all relevant Federal, state and county regulations and follow the directives of duly authorized officials. Disposal of poultry carcasses in North Carolina is under the jurisdiction of the State Veterinarian. The State Veterinarian approves all methods which may be used for disposal, and in addition directs disposal in times of disease outbreak or natural disaster which may result in mortality levels too high for normal disposal methods. The authority for this jurisdiction lies in General Statutes 106-403 (Appendix A), 106-549.70 (Appendix B) and the NC Administrative Code 02 NCAC 52C (Appendix C). Failure to comply with NC General Statutes or Administrative Code in the disposal of dead animals may result in a civil penalty of up to $5,000 per violation. In a recent opinion article in the National Provisoner Dr. Robin R. Ganzert, President and CEO of the American Humane Association (AHA) commented on the need for an ethical and reliable third-party auditing system to provide consumers with a sense of security concerning the livestock products they purchase. The article as circulated by the AHA is reproduced for the information of readers of CHICK-CITE. There was a time in our culture when many consumers were more connected to food and agriculture. Citizens knew a farmer or grew up near a farm, milk was delivered directly to people’s doorsteps, and consumers regularly visited their neighborhood butcher. Yet business consolidation, innovation and technology dramatically changed this way of life, seemingly right before our eyes. Similarly, animal welfare in food production is no longer just about farmers and ranchers and the way they treat their animals. It is now part of a comprehensive food system that includes consumers, retailers and restaurants, government and regulatory agencies, NGOs, auditors and certifiers, and educators. Our food system is predicated on a model of safety and affordability while aspiring to a balance that is moral and defensible. The recent antibiotic workshop during the 2014 IPPE during late January stressed the imminence in replacing antibiotics used for growth promotion with alternative feed additives by 2016. Entering in resonance with this upcoming ban Chick-fil-A, the nation's largest chicken chain in annual sales, announced last week that the company plans to only sell chicken raised without antibiotics at all of its stores within five years. Familiar names such as Panera, Chipotle and Jason's Deli have already gone in this antibiotic-free direction; however the Chick-fil-A decision demonstrates that the corporate trend towards cleaner food seems to be catching fire. The great majority of the antibiotics fed today to broilers are for controlling gut health by limiting enteritis conditions and for promoting growth by decreasing postprandial (low-grade) inflammation response. Gut health plays a vital role in broiler production. Only a healthy gut can digest and absorb the maximal amount of nutrients to obtain the most out of the diet. If the digestive system is compromised, its requirements for energy and protein increase sharply. This can severely diminish the nutrients available to the bird for growth and thus slow weight gain, leaving a plunge in feed efficiency. In addition, most intestinal challenges will lead to reduced feed intake that can further impact bird performance. It is generally accepted that in the context of modern commercial egg production it is necessary to apply some form of beak treatment to prevent cannibalism and feather picking which are manifestations of aggression. Due to welfare considerations, regulatory authorities in many countries in Europe are intent on banning beak treatment which they consider an “amputation” or “mutilation”. This action may in many situations paradoxically result in a lower standard of flock welfare as the results of beak-induced injuries will be intensified. In Germany, Paragraph 6 of the Animal Protection Code bans beak trimming although exceptions can be allowed, subject to approval by state veterinary authorities. Shortening of the beak will be allowed for the next four years but the procedure must be performed before the 10th day after hatch. The Nordic nations and Switzerland completely forbid any beak treatment. The Netherlands has announced a ban which will take effect in 2018. In the UK, cessation of beak trimming is scheduled to commence in 2015. The RSPCA which is the leading arbiter of welfare in Great Britain allows commercial layer hatcheries to apply the Infrared Beak Treatment system for pullets destined for production under the Freedom Food Program. In a recent Departmental seminar at the North Carolina State University, Prestage Poultry Science Department, Dr. Eric Gonder reviewed development of the U.S. turkey industry through each decade since the 1940’s. According to USDA Economic Research Service projections, the industry produced 2.64 million metric tons of processed turkey in 2013. This will increase by approximately 1.4 percent in 2014 to 2.68 million metric tons. In reviewing expansion, it is noted that since 2010 the industry has recorded less than a 1 percent average annual increase to date. Exports have increased from174,000 metric tons representing 7 percent of output in 2010 to 355,000 metric tons projected for 2014 comprising 13 percent of production. Over the past five years, exports have increased at approximately 20 percent per annum albeit from a small base. Recently EGG-CITE approached Wayne Pacelle, president of the HSUS to discuss aspects of the relationship between his Organization and the U.S. egg production industry. Wayne graciously assented and replied in writing to questions posed to him. EGG-CITE is presenting the dialogue in its entirety for the benefit of Subscribers and readers. The HSUS is regarded by many as an implacable foe of intensive livestock production. The interview provides depth and perspective and irrespective of one’s standpoint on welfare the views of the person leading the nation’s most influential organization are certainly relevant to our industry. EGG-CITE is neutral and neither endorses nor opposes the sentiments presented. Contrary or supporting views are welcomed as these will add to the ongoing debate. Recognizing the limitations of supercenters, some national chains are considering smaller local stores. These offer the convenience of a dollar store, but with a product range reminiscent of a 1980s supermarket and the added convenience of local access, available fuel and fast food. Kroger is evaluating the Turkey Hill Market concept in Columbus, OH. with a 7,500 square foot unit. This store has approximately twice the area of a Turkey Hill Minute Market but the floor area is only a tenth of the 70,000 square foot of an average Kroger store. The Occupational Safety and Health Administration has levied a fine of $122,000 on Tyson Foods Inc. for violations at a plant in Buffalo NY. The case arises from an inspection carried out by the Agency as a component of their Site-Specific Targeting Program. EGG-CITE recently had the opportunity to sit down with Bill Snow, Cage-Free/Alternative Housing Specialist with Big Dutchman USA, to discuss current equipment and trends in alternative housing. Bill graduated with a Baccalaureate degree in business from Indiana Wesleyan College in 2005 and shortly thereafter joined Big Dutchman. Since 2007 he has been assigned responsibility for coordinating aspects of field service and applied development of alternatives to confined housing, based on the experience gained by the company in Europe and the U.S. The FDA has issued a proposed rule to impose Good Manufacturing Practices based on hazard analyses and risk-based preventive controls for feed supplied to livestock and companion species. The proposed rule is based on the Food Safety Modernization Act signed into law on January 4th 2011. Previously EGG-CITE has listed scenarios under which egg producers would be subject to the FSMA. Generally in-line units supplied by an on-site or Company-owned feed mixing plant dedicated to the complex would be exempt from the FSMA proposed rules. It is however the opinion of this commentator that all feed plants, despite their legally-exempt status, should operate in consistency with the intent of the proposed rule. The ISA Layer Breeding Company, part of the multi-species Hendrix Genetics Company, has recently announced that it is developing strains that will lay 500 first quality eggs per hen housed in one cycle. ISA (Institut de Selection Animale), with headquarters in the Netherlands, was founded in 2005 after the merger of ISA of France and Hendrix Poultry Breeders of Holland. Today ISA manages large North American and European -based layer gene pools consisting of ISA, Babcock, Shaver, Hisex, Bovans and Dekalb genetics. At the time of the merger in 2005, ISA had been evaluating pure-line performance to 80 weeks of age for several years, and Hendrix Poultry Breeders in the Netherlands had operated a parallel program for over a decade. After the merger, the testing duration was extended to 100 weeks of age. As George Ansah, Senior Geneticist at ISA, comments: “The extended production cycle adopted in our tests is the real key to realize our mission to breed layers capable of laying 500 first quality eggs, because what we have learned from past observations is that birds that produce the best eggs at 60 weeks are definitely not always the birds that also produce the best eggs at an older age”. The American Egg Board has recently released the results of a national survey conducted to quantify the use of further processed eggs in food service and food manufacturing. In the Webinar presentation by John Howeth, Vice President of Ingredient and Commercial Marketing for the American Egg Board, it was evident that efforts to promote eggs to the major restaurant chains will be the most beneficial in terms of increasing demand. The research project involved determining trends in five formats (liquid, dry, frozen, pre-cooked and hard cooked) and their respective distribution channels (food processing, industrial, food service, export). Each year the U.S. Poultry and Egg Association organizes a seminar on production and health. Traditionally the program emphasizes the broiler segment of the poultry industry but in the most recent program there were a number of presentations that have either indirect or derived application to egg production. A nutritional study conducted by Dr. Sally Solomon from the Institute of Biodiversity, Glasgow, United Kingdom, published in British Poultry Science* indicates the effect of bioplexed micro- mineral supplementation on shell strength through the production cycle. The experimental design included a control diet, supplementation with sodium selenate a bioplexed selenium supplement (Sel-plex®) (Alltech) and a combination of Sel-plex® and Bioplex® a combination of mineral proteinates. Bioplex® supplied iron and copper at a level of 5 ppm and manganese and zinc at 20 ppm in diets. Selenium was supplemented in the form of either selenate or the commercial Sel-plex® additive at 0.3% in diets to provide 3 ppm selenium. A new SNP (Single Nucleotide Polymorphism) detection chip, developed by Hendrix Genetics Research and Technology Centre, will enable ISA to respond more quickly to demands from the Industry and to make their genetic selection procedures both faster and more efficient. Earlier this year Hendrix Genetics introduced a new Medium Density Chip with 60,000 SNP markers to replace the previous version. The latest SNP Chip was custom made for ISA and will be proprietary to the Company. The main advantage of this chip is that it is more suited to the specific genetic make-up of ISA chickens. All chickens in the ISA genomic selection program will now be genotyped using this new chip, which will significantly improve the depth and precision in understanding the chicken genome. The new chip is considerably more sensitive in identifying genetic variations within a flock. This will facilitate selection of birds that express the specific traits required by the egg industry. The new technology goes beyond conventional production traits including egg numbers, egg size, feed conversion ratio and daily gain. ISA can now select for issues such as flock interaction and behavior, skeletal integrity and locomotory function, keel bone strength and susceptibility to specific diseases among other traits. The new chip can be compared to an update of a satellite navigation system. New points of interest have been added, which increases the available amount of genomic information. Geneticists will be able to assess a greater quantity of data and to obtain more accurate information required to select the next generation of world-class hens. Hy-Line International is undertaking a 4-year expansion project comprising research farms and a new hatchery. The initial phases that were completed within the past two years included a complete remodel and upgrade of the Dr. James Arthur Research and Development Farm and construction of a hatchery dedicated exclusively to pedigree and grandparent stock. A new research layer farm, currently under construction, will use the latest environmental control technologies including full panel walls as well as superior ventilation and filtration systems that have proven very successful at the new pullet farm. The additional research farm will complement the Genomic Selection Program, improving the accuracy in the selection process. The UEP has appointed two experienced professionals to improve service to members. EGG-CITE takes this opportunity to introduce them to Subscribers. David Inall now serves as a Senior Vice President replacing Chad Gregory who has advanced to President on the retirement of Gene. David recently provided an interview in which he discusses his background and aspirations. EGG-CITE: Welcome to the U.S. egg industry David. Please provide a brief overview of your experience. David Inall: I am pleased to be in the U.S. and to be affiliated with a fine organization of producers. In my immediate past career I was involved in the livestock industry in Australia. This led to extensive experience in Asian countries including Indonesia, South Korea, the Philippines and Malaysia. For the past eight years I was the CEO of the Cattle Council of Australia and was deeply involved in lobbying, as an industry spokesperson in the media, trade and market access issues. Dr. Damien McLoughlin, a Professor at the Michael Smurfit Graduate School, University College, Dublin, reviewed strategy for companies with special reference to identifying and capitalizing on the core of a business. This approach is necessary with respect to expansion, acquisition and even survival in a competitive environment. McLoughlin cited Wang and Kodak as companies which failed to grow and ultimately died since they did not recognize and develop their core competencies. It is an unfortunate reality that 90% of growth plans fail due to failure to reconcile intended action with the realities of the business environment. McLoughlin attributed failure to the fact that management fails to recognize and exploit the core of their business. To relate the core activities of the company to the needs of customers. This allows the company to grow through adjacencies, concentrating on activities and ventures which reflect the core and draw on resources and capabilities in place. Elliot Belilos an attorney with Olsson, Frank, Weeda, Terman and Matz in Washington DC recently reviewed employment screening and hiring practices which might exclude the possibility of an intrusion by an employee of an animal rights or activist group. He strongly recommended that egg production companies should consult with their legal representatives to ensure that application forms include a certification of accuracy and consent to background checks. Naturally, applicants must sign releases agreeing to appropriate verification and scrutiny. The Egg Industry Center (EIC) arranged the 5th Annual Egg Industry Issues Forum to review current concerns and opportunities for the egg production industry in St. Louis during the period April 16th-17th. Ms. Nicole Clausen of the FDA provided an update on progress in implementing the Egg Safety Rule at the 2013 Egg Industry Forum held in Saint Louis April 16th-17th. During the period January through September 31st 2013, the FDA carried out 64 new inspections and 31 follow-up inspections. The latter were motivated by Voluntary Action or Required Action letters. Of the 187 drag samples collected during inspections, seven yielded SE. During the nine-month period, 48 No Action inspections were recorded. There were 35 Voluntary Action and 18 Required Action inspections. There were 36 FDA Form 483s issued and 17 warning letters. There were neither injunctions nor seizures during the period under review. In a press release dated April 2nd 2013, the Pew Charitable Trust released a report entitled “Too Slow: An Analysis of the 2011 Salmonella Ground Turkey Outbreak and Recommendations for Improving Detection and Response. The outbreak involved 130 patients and was associated with 37 hospitalizations and one fatality. The report faults the federal agencies involved in investigating and controlling food-borne outbreaks for their tardiness in identifying the source of infection and taking appropriate action. The Centers for Disease Control and Prevention (CDC) and the U.S. Department of Agriculture, Food Safety and Inspection Service apparently took 22 weeks following the first reported case to identify the contaminated food vehicle. On August 3rd 2011, Cargill began a recall which ultimately extended to 36 million pounds of ground turkey, much of which had in fact been consumed. EGG-CITE has chronicled the introduction and subsequent financial debacle created by TESCO following entry into the U.S. market with the Fresh and Easy chain. The most recent commentary in EGG-CITE dated February 11th documented the unfavorable performance of the U.S. subsidiary and noted the Corporate decision to dispose of their liability in the U.S. on December 10th 2012. Uncertainty exists as to weather conditions which will determine size of the 2013 corn crop. At the recent USDA Annual Outlook Conference, Dr. Brad Rippey an agricultural meteorologist claimed that the 2012 drought was a “once in a lifetime occurrence”. If in fact global warming is a reality, the events of 2012 may well reoccur before 2099. We have had far too many “once in a century” floods, tornados and hurricanes during the past decade. Commenting on future rainfall based on past patterns might well be analogous to determining the performance of the stock market based on previous trends. Sometimes a correlation with past patterns may be accepted if there is some definable basis such as transition from an El Nino to a La Nina. These events clearly follow cyclic patterns which can be used to predict rainfall in broad areas of both hemispheres. Perfect Polka: Use the eraser end of a pencil to paint perfect polka dots on the egg. Just dip the eraser into acrylic craft paint and dab onto the egg. Make different patterns and use different colors to create perfect designs. Tattoo Decor: Kids always have those temporary tattoos lying around their rooms! Why not make egg decorating simple? Apply those same tattoos to eggs for a professional and easy look that kids will love. Ribbon Wrap: Tie a beautiful ribbon around a dyed egg. Mix colors and patterns for fun visual interest. Adorn with craft or fabric flowers, even buttons. For a more rustic look, use natural fibers such as hemp or twine with dried flowers in place of the ribbons. By: Anthony Quant, Ph.D., Paul M. Kalmbach, M.S. In today’s health conscious society, there is an increasing demand for eggs fortified with omega-3 fatty acids. This is due to the fact that omega-3 fatty acids, notably 18:3n3, alpha-linolenic acid (ALA) and 22:6n3 docosohexanoic acid (DHA), have been suggested as being beneficial in reducing the risk of cardiovascular disease in humans. Traditionally, fortifying eggs with omega-3 fatty acids has been accomplished by feeding hens whole flax seed. A proportion of the omega-3 oils in flax seed are converted to DHA and deposited in the egg yolk by the hen. With current high ingredient prices, there is increasing demand for high-value feed ingredients for the egg industry, especially for the production of value-added omega-3 enriched eggs. OmEGGa® is a cost-effective source of omega-3 fatty acids for laying hens. Dr. Richard Gast of the Egg Safety and Quality Research Unit USDA-ARS Russell Research Institute in Athens Georgia recently published on the infectivity of SE under experimental conditions*. A slide presentation with commentary on this topic was posted on EGG-CITE on October 29th 2012 under the “Presentations” tab. A number of publications contributing to our understanding of the epidemiology of SE are based on previous papers authored by Dr. Gast and his research team. A significant question raised relates to the oral dose in relation to vertical transmission. Previously high doses, in the region of 107 to 108 were administered to hens to study infectivity. Joanne Ivy serves as president and CEO of the American Egg Board (AEB). She succeeded to the position in 2007 replacing Louis Raffel. Joanne has been affiliated with the AEB for 25 years during which she has assumed positions of increasing responsibility. In 2005 Joanne was awarded the International Egg Commission (IEC) Douglas Wellstead Memorial Trophy as the International Egg Person of the Year. This was in recognition of her considerable contributions to the promotion of eggs both in the U.S. and other member countries. In September 2010 she assumed the Chair of the IEC. Achievements during her tenure as President & CEO at the AEB have included establishing and promoting World Egg Day, initiating research to confirm that eggs are lower in cholesterol and higher in vitamin D, increasing egg servings at Quick Service Restaurants, stabilizing the decline in consumer demand, implementing an egg farmer image campaign, and re-launching the “Incredible Edible Egg” jingle first released in 1977. In 2009, the Egg Nutrition Center moved from DC to be housed with AEB, which provided for a more strategic, integrated marketing approach with a major financial commitment to expanded nutrition research. Her philanthropic activities include overseeing AEB’s relief efforts for the Southeast Asia Tsunami and Haiti earthquake victims and leadership roles in coordinating hunger relief in various U.S. cities such as Joplin and areas affected by Hurricane Sandy. Leading convenience-store chain, 7-Eleven is gradually introducing fresh foods and reducing portion sizes in its servings. The corporate plan is to extend the range of ‘healthy foods’ to generate 20% of sales by the middle of this decade. According to recent items in trade periodicals and a New York Times article published on December 24th the chain is constantly searching for new product lines which offer acceptable margins. Inherent to this approach is the fact that sales of cigarettes, previous a 7-Eleven staple, have declined. Revenue from the new range will supplement sales from sodas, beer, candy and traditional snacks. Dr. Eric Gingerich presented the results of a survey covering members of the Association of Veterinarians in Egg Production at the meeting of the U.S. Animal Health Association meeting on October 22nd 2012. Members of the AVEP were asked to rate the prevalence of common diseases of pullets and hens held in either caged or non-confined systems. Among caged pullets, yolk infections and “starve-outs” were regarded as the most significant conditions recorded. This reflects adversely on the quality of pullets delivered to farms. Among caged-pullets, Marek’s disease and E. coli were ranked 3rd and 4th respectively. In non-confined pullets, coccidiosis and Marek’s were the 3rd and 4th highest ranked conditions of significance. Mid- ranked conditions included infectious bronchitis, ILT and Ms. It was significant that Mg was not regarded as a common infection responsible for losses. Dr. Nelson E. Ward of DSM Nutritional Products Inc., a leading manufacturer of vitamins has prepared a literature review of methods to preserve potency. Intended for broiler producers the principal objective was to consider protecting the activity of vitamins in pelleted feeds. Although diets for commercial egg producing flocks are fed in mash form, stability may emerge as a problem following prolonged storage or exposure to high temperature. Vitamins which are predisposed to oxidation include Vitamin A, Vitamin E (especially in the alcohol form) and Vitamin K all of which are fat soluble. Some B-Group vitamins including thiamin and folic acid are degraded when subject to the Maillard reaction at high temperature. Faced with the inevitability of having to convert 15 to 20-year old high-rise units to more welfare-friendly housing, Jacques Klempf of Dixie Egg Company opted to convert these units at his Humpty Dumpty farm to non-confined systems. The four houses selected for conversion were conventional 600 ft x 50 ft high-rise houses each holding 72,000 hens fitted with four-tier A-frame cages. Alternatives considered included installing enrichable cages with the option of later converting to an enriched configuration or to opt for a non-confined system. Based on the demand for cage-free and especially organic in the market served by the Dixie, Klempf and his team devised a two-level design which could be used to house either organic or cage-free production. Current market trends in US corn and soybean meal prices are pushing future prices to record highs. In the case of soybean meal prices, it has been influenced by the dry-weather, which is projected to reduce soybean yield potential to below expected levels. Additionally, corn crops have also suffered from the adverse weather and production yields will not be reaching their potential. Broiler integrators must consider innovative alternatives to counter rapidly rising feed costs. RONOZYME ProAct is a protease that improves the digestibility of proteins and reduces feed costs. According to the National Chicken Council, Washington Report of July 20th Dr. Thomas Elam, President of Farm Econ LLC., has recently completed a study on the economic impact of the Renewable Fuels Standard (RFS). The study was funded by the National Chicken Council, the American Meat Institute, California Dairy Inc., the National Cattlemen’s Beef Association, the National Pork Producers Council and the National Turkey Federation. John Starkey has led the U.S. Poultry and Egg Association (USPOULTRY) since December 2007. He is an engineer by profession with a Baccalaureate degree in chemical engineering from Purdue and a Masters Degree in Environmental Engineering from Georgia Tech. He has worked with a number of major producers including Gold Kist and Hudson Foods. He was appointed as VP of Environmental Programs for USPOULTRY in 2000 and promoted to his present position on the retirement of Don Dalton. Recently EGG-CITE had the opportunity to review current issues with John. EGG-CITE: Please indicate some of the challenges and achievements during your tenure as President of USPOULTRY. John Starkey: One of the most important achievements has been balancing the budget of USPOULTRY especially after the onset of the recession in 2008. Fortunately we have been able to establish a firm sustainable footing for the Association with a balanced budget for the last two years. The second achievement has been the co-location of the International Poultry Exposition, the American Meat Industry Trade Show and the International Feed Exposition. This combination will form the International Production Processing Expo (IPPE) in 2013. Congresswoman Louise Slaughter (D-NY.) an implacable opponent of antibiotics in food production, has released findings from a survey regarding antibiotics used in the production of food from flocks and herds. The questionnaire was sent to 60 QSRs and FMI members requesting details of their policies on antibiotics. In commenting on the survey, Slaughter stated “the food industry has provided us with valuable information and with that knowledge we must act”. From the sentiments expressed by the worthy Congresswomen it is presumed that the answers to the questionnaire were predictable and represented an oversimplification of what is otherwise an extremely complex situation. The survey demonstrated acceptance by the food industry of preventive and therapeutic administration of antibiotics which are administered in consistency with FDA approvals. To obtain a license, applicants must supply extensive data demonstrating effectiveness, safety and freedom from residues. The question of drug resistance is now emerging and has added a new dimension to the issue. The following presentation was delivered at the 2012 Alltech Symposium and is reproduced with edits for readers of EGG-CITE.com. “Farm-to-Fork” traceability in food production requires that animal feeds should be produced using high standards of hygiene. Preventing microbial contamination of diets in feed mills is essential to prevent pathogens and toxins from entering the human food chain. The feed industry operates in a dry production environment which should limit microbial growth. A nidus of infection with bacteria or fungi may develop in areas of a mill due to moisture from condensation, structural defects or residual water after wet cleaning. Bacteria may form biofilms in these locations which allow persistence of microorganisms in biofilms which are refractory to disinfection. Neglect of cleaning and disinfection may lead to the accumulation of organic material including dust and feed residues. The efficiency of many disinfectants is reduced in the presence of organic material. This edited version of the presentation made by Prof. Patrick Wall is based on a paper delivered at the 2012 Alltech Symposium. Given the projected growth in global population, the long-term outlook for the agri-food sector is promising. Huge opportunities are presented by emerging markets for dairy products, eggs and meat. Genetic selection is creating the potential for animals with greater efficiency with respect to growth, reproduction and conversion. New technologies pioneered by Alltech including programmed nutrition will contribute to achieving genotype. To attain gains from improved genetic strains, management, housing, health and welfare must be optimized. In addition, consumer perception of how food is produced is crucial if the image, or the reality, of wholesome, natural, environmentally friendly and sustainable output is to be achieved. The Brazilian perspective on real nutrient requirements. The summary below highlights the presentation by Prof. H. Rostagno delivered at the 2012 Alltech Symposium. A series of research studies was conducted to update and improve on the Brazilian Tables for feed composition and nutritional requirements for poultry. In the new 3rd edition of the Brazilian Tables* requirements for the most important nutrients are tabulated as daily amounts to optimize performance. A factorial method was applied when possible, following the model: Nutrient requirement (g/day) = g for maintenance + g for production. Genetic selection is continually changing the production potential for the poultry industry. Expression of genetic potential is the prime driver of performance and profitability. Early-life programming can turn on “thrifty” genes that permanently reprogram normal physiologic responses. These contribute to survival following exposure to environmental stressors, including moderate nutrient deficiency. This increases the probability that genes are passed on to the next generation. Poultry can be programmed to express desired phenotypic traits by modifying nutrition during the perinatal period, extending from 4 days before and after hatch. Konos Inc. was established in the mid-1940s by Howard and Alida Vande Bunte in the town of Martin located in the Southwest corner of Michigan near Kalamazoo. Paul and Tim, sons of the founders, who respectively serve as president and vice president of the Company represent the second generation of ownership. They were recently joined by Rob Knecht grandson of the founders and nephew of Tim and Paul. The name Konos is derived from the biblical Greek Diakonos which means to serve with a willing spirit. The philosophy of the Vande Bunte Family has been to always operate according to the most ethical principles to provide consumers with a safe quality product and to interact and contribute to the community in which they are located. Chad Gregory now serves as the Senior Vice President of United Egg Producers, our industry organization representing over 90% of the Nation’s production. Chad grew up in the egg business as his father Gene, the current President and CEO of the UEP who has been involved with U.S. egg production for over 50 years. Chad earned a baccalaureate degree with a double major in management and marketing from Southern Illinois University. He has been affiliated with the UEP for over 14 years and when he was the Director of Membership he visited farms and plants operated by virtually all members of the UEP. Most recently he served as the UEP representative in discussions with the HSUS which led to the agreement which will hopefully be codified in H.R. 3798, the Egg Products Amendments Act of 2012. Dr. M. Muldoon of SDIX, Newark, DE, provided data on the sensitivity and specificity of the SDIX RapidChek® SELECT ™ Detection System. This kit approved by NPIP, FDA and the AOAC incorporates a 2-stage enrichment applying bacteriophages in a medium requiring 48 hours, followed by detection in a 10-minute assay. The 2012 Western Poultry Disease Conference, held this year in Phoenix AZ. included some important presentations of interest to egg producers. Highlights are posted today but more detailed interpretive reviews will appear in EGG-CITE.com in succeeding issues. The 2012 Symposium on Food Safety Challenges in the Poultry Industry organized by the American College of Poultry Veterinarians was held on April 1st in Scottsdale AZ. The topic was selected by the Program Committee based on the intensity of regulatory activity affecting poultry meat production by FSIS action and in the case of egg production, by the FDA. A number of speakers representing industry and academia considered aspects of research and practical control measures to improve compliance with federal regulations, to control diseases of public health significance and to reduce the financial impact of recalls and legal action following episodes of foodborne infection. Dr. Kenneth Anderson of the Department of Poultry Science North Carolina State University presented data on a random sample test which compared the performance of two commercially available brown feathered hens with a Barred Plymouth Rock, heritage breed. The commercial brown feathered strains were reared either on range, as cage-free or in cages to ensure that the rearing system was compatible with the laying system with respect to subsequent performance. Who Are The "Humane Farming Association"
The Humane Farming Association (HFA) has come to prominence opposing the recent HSUS/UEP Agreement and H.B.3798 which they refer to as the “Rotten Egg Bill”. The HFA is actively campaigning and encouraging its members to sign petitions against the proposed legislation. They apparently ignore the obvious advantages which are intended to improve management and welfare of flocks and provide stability for the industry as a secure supply of a nutritious product to consumers. The objectives of the HFA are furthered by Dr. Nedim C. Buyukmihci, an Emeritus Professor of Veterinary Medicine, University of California Davis who states “the cage as defined by the legislation will in no meaningful way reduce the unimaginable suffering endured by the hens”. Kathi Brock has guided the Welfare Certification Program of the American Humane Association (AHA) since the original program was developed in 2000. Recently EGG-CITE.com had the opportunity to discuss the AHA program with Kathi (KB). EGG-CITE: Please tell us a little of the history and objectives of the AHA. KB: The American Humane Association was established in 1877 and has been a leader in every major advancement in protecting children and animals from abuse and neglect. Our mission statement is “To create a more humane and compassionate world by ending abuse and neglect of children and animals”. Our programs directed to animals include shelter services, farm animal welfare, the “No Animals were Harmed® Program and the Second Chance® Fund. Our professional resources include animal behavior and training, humane education. The AHA circulates various publications including The Link. We provide resources for shelter professionals and emergency management and response and we have an extensive program of grants for research and evaluation of welfare systems and training. We are constant advocates for children and animals and our legislative involvement includes providing our Administration and Congress with information to further our objectives. We partner with a number of prominent companies and organizations including MetLife, Maddie’s, Proctor and Gamble, the Petco Foundation and U.S. Bank. Some of our celebrity supporters include Betty White, Chef Fabio Vivani, Dr. Debbye Turner-Bell, Martha Stewart, Dr. Temple Grandin and Whoopi Goldberg. The 2012 Alltech Lecture Tour will visit 110 locations in 67 nations. It is expected that over 5,000 attendees will hear presentations by teams of Alltech scientists. The purpose of the lecture tours is to acquaint faculty and students at universities, managers of production operations, regulators, scientists and poultry health professionals with advances in biotechnology and to detail innovations by Alltech. The program arranged for the North Carolina Triangle took place at the prestigious Umstead Hotel near Raleigh on Friday 3rd January. Dr. Paulo Rigolin discussed opportunities in agriculture, a topic of especial interest to the graduate students at North Carolina State University. The challenges facing production in the proximal decade will be to make agriculture exciting, profitable and sustainable. An immediate challenge facing the livestock industry is how best to use 53 million tons of DDGS which will be available in 2012. Projects to add five incremental eggs over the productive life of a laying hen and parallel initiatives in broiler breeders, hogs and dairy were reviewed. These advances will be achieved through application of nutreogenomics, pioneered by Alltech. Studies conducted by the Company in collaboration with leading Land Grant universities have led to the principle of Programmed Feeding which has the potential to enhance the quality of beef, broiler meat and eggs. As part of the Global Competiveness Symposium organized by USPOULTRY at the 2012 IPE Dr. Ferry Leenstra and colleagues of the Wageningen Livestock Research Center in Holland presented data on consumer surveys conducted in Western Europe. The major purchase determinant of brand or type is availability on the shelf. The document which was released during the Summer of 2011 reviewed alternative housing systems including enriched modules now mandated in the EU and the German Kleingruppenhaltung (small group housing) and other non-confined systems including barns and pasture. The directive EU of 1997/74EC banned cages as of January 1st 2012 and allowed only enriched modules and alternatives to be used. The Kleingruppenhaltung is similar to the enriched cage and comprises a group of approximately 50 hens with greater height and floor area per hen compared to enriched modules. Sweden and Switzerland do not allow any confined system and Germany recognizes only their version of the enriched cage as an alternative to confinement. BioChek, headquartered in the Netherlands, will soon commence U.S. distribution of a chicken Salmonella serum antibody detection kit applying ELISA technology. Widely used in Europe, this kit, which is highly sensitive, has the ability to measure the level of antibodies against Groups B and D Salmonella following vaccination. According to Tim Goode VP and General Manager of BioChek Corp. the U.S. subsidiary located in Scarborough ME, the Company has now received final approval from USDA and will commercial release of the test system. Kits were imported into the U.S. during 2011 by vaccine manufacturers under special license for research and evaluation and to monitor the response of flocks to specific vaccines under controlled conditions. The test will be offered as a technique to establish the antibody response following administration of Salmonella Groups B and D vaccines to monitor geometric mean flock titer and to ascertain uniformity among vaccinates. A non-vaccinated flock which screens other than completely negative on assay could be regarded as having been exposed to either a group B or D Salmonella, although the ELISA test kit is not intended as a diagnostic procedure to establish freedom from SE or exposure. Drag swabs and egg pool assays have been mandated by FDA to determine the SE status of flocks and their environments. Dr. Nelson E. Ward of DSM Nutritional Products Inc. has recently reviewed biotin requirements for broilers with specific emphasis on integrity of skin and the quality of broiler feet. This has stimulated a consideration of the role and benefits of biotin supplementation in the egg production industry. Biotin has been recognized as an essential nutrient since 1940 although there was evidence of a nutritional requirement for an unidentified factor from the mid 1920’s onwards. In 1940 “Vitamin H” which had been described as a factor essential for the development of skin and a second compound “Coenzyme R” involved in plant metabolism, were recognized as a common nutrient. In 1942 the structure of biotin was characterized followed by synthesis of the vitamin in the following year. Don Bel, Poultry Specialist Emeritus of the University California, Riverside has questioned the accuracy of the October 2011USDA value of 23.3% posted for the number of flocks in the second cycle of production. According to Bell a typical molt program extends for 70 weeks to 105 weeks at which time the flock is sold. The 35 week duration of the second cycle represents 41% of the 85 weeks of production from a nominal 21 weeks through 105 weeks. It is assumed that 60% of flocks are molted and 21.7% of hens are in a second post-molt cycle at any time. This calculation does not take in to account the non-producing inter-cycle period of approximately 3 weeks. If molt is initiated at 70 weeks and flocks are depleted at 105 weeks the second production cycle is 33 weeks in duration or 39% of the entire production period extending from 20 week to 105 weeks. The assumption that 60% of flocks are molted is always speculative and it subject to considerable differences according to region. The October 2011 value of 24% posted by USDA incorporates a molt value of 42% for the Northwest region but only 7.1% for the Northeast. Accordingly the assumption that 60% of flocks are molted is generous in the light of current practice as driven by feed cost and the supply-demand relationship. Since the inception of the FDA Final Rule on suppression of SE producers have turned to state and commercial diagnostic laboratories to provide rapid, reproducible results on environmental swabs and egg pool assays. Conducting tests and interpreting results is generally routine but problems may occur as a result of improper laboratory technique or failure to recognize the high sensitivity (see block for definitions) which is required for a screening test. The SDIX RapidChek® SELECT ™ Test System provides highly sensitive responses. In the event of a negative result on drag swabs, the environment of a house can be regarded as free of Group-D1 Salmonella. In the event of a “presumptive positive test” it is necessary to proceed to conventional microbiology using selective media. In view of the high level of contamination in enriched samples obtained from environmental swabs, the SDIX RapidChek® CONFIRM™ Immunomagnetic Separation Kit has been developed to expedite diagnosis. Dr. Barbara J. Grabkowsky of Lohmann Animal Health in Germany reviewed disease control in a recent presentation at the 2011 Pennsylvania Poultry Sales and Service Conference. Her observations were based on experience in Europe controlling Salmonella infection. In response to the demand for advice on suppressing food-borne Salmonellosis, Lohmann Animal Health has embarked on a program of assessing the probabilities of infection occurring on a specific farm. They have developed a Zoonosis Risk Index (ZRI) in an attempt to develop sanitation and prevention programs. The approach involves three phases. The first involves an initial assessment of risks and identifying potential mechanisms for introduction of disease mainly associated with deficiencies in biosecurity. The second phase involves implementation of measures designed to reduce risk of infection. The subsequent third phase requires monitoring in the form of audits to evaluate the efficacy of preventive measures. Fluctuation in commodity prices, abnormal weather conditions, increasing demand from Southeast Asia and domestic recession have all created uncertainty for the soybean production segment of agribusiness. The United Soybean Board has reported on a commissioned study to evaluate factors which will influence future demand for both meal and oil derived from soybeans. The study is timely in relation to the projected 8% decline in the 2011 harvest compared to 2010. A presentation on the impact of the FDA Final Rule on Prevention of SE was made at the 2011 Pennsylvania Poultry Sales and Service Conference held concurrently with the 83rd Northeastern Conference of Avian Diseases. A presentation by Dr. Bill Pierson the VA-MD Regional College of Veterinarian Medicine at the 83rd Northeastern Conference on Avian Diseases reviewed financial aspects of medication. Dr. Pierson emphasized that antibiotic therapy is an added cost of production and it essential to predict whether treatment will be cost effective. The paper was based on medication of broiler flocks and accordingly calculations were prepared to determine the potential additional egg production required to cover the cost of feed medication. In actual practice producers are restrained in their use of antibiotics in feed for laying flocks and are effectively restricted to tylosin during production unless a withdrawal period is allowed. On June 2nd USDA threw in the towel and abandoned the much maligned nutritional recommendation based on the “pyramid”. The new icon comprises a plate with segments designated for major food groups www.choosemyplate.gov. The old pyramid when introduced in 2005 was confusing and possibly understood only by its creators. There are many ways to look at the past: as a list of important dates, a conveyor belt of kings and queens, a series of rising and falling empires or a narrative of political, philosophical or technological progress. This talk will look at history in another way entirely: as a series of transformations caused, enabled or influenced by food. The success of organizations operating in complex environments depends on how well supply chains adapt to disruptions caused by unanticipated events. Building this resilience requires the capability to identify risks and uncertainties and to model the impact of these forces on operations. A chronology of food scares, many linked to ingredients in animal feed, continue to generate consumer anxiety and sensational media coverage. The food chain has became increasing global in scope with more stages that ever before. With the increasing number of stages there are more opportunities for errors. The more players there are in the food chain, the more likely one of these may be negligent or worse still a criminal. The American Feed Industry Association is in the process of implementing a major initiative that will lead the industry in meeting long-term sustainability for our producers, customers, consumers, feed industry, food industry and the global environment. To be successful, we will need to effectively respect and meet the needs of each constituency. The price of fat has increased from less than 10 cents to over 50 cents per pound over the past five years. This increase in price has lead to a re-evaluation of this ingredient in U.S. layer diets incorporating corn-DDGS and soybean meal as the main ingredients. The following presentation at the Alltech 27th Annual International Animal Health and Nutrition Symposium has direct application to rearing of pullets especially with floor housing. Recently Runting and Stunting Syndrome has been documented in brown-feathered pullets and may become a problem in the egg production industry. Recent escalation in the cost of production has forced egg producers to examine all possible areas to reduce expenditure and enhance efficiency. Robotics offers opportunities in egg packing plants as demonstrated by installations which are yielding an attractive return on investment and acceptable payback periods. Robots are infinitely superior to mechanical systems for a number of applications in egg handling and packing. The announcement that Domino Printing of the UK has invested $50 million in a new company to etch individual eggs with a plant code and expiry date is eerily reminiscent of the now defunct Egg Fusion endeavor which failed to gain traction in the egg industry during the mid 2000’s. The joint-venture company has received from private equity investment based on technology developed by NewMarket Impressions. An interpretive review of presentations at the 60th Western Poultry Disease Conference in late March is provided for readers of Egg-Cite.